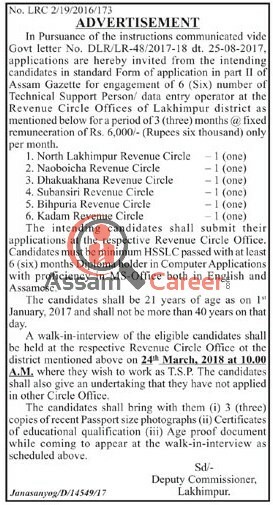 Applications are hereby invited from the intending candidates in standard Form of application in part II of Assam Gazette for engagement of 6 (Six) number of Technical Support Person/ data entry operator at the Revenue Circle Offices of Lakhimpur district as mentioned below for a period of 3 (three) months @ fixed remuneration of Rs. 6000/- (Rupees six thousand) only per month. How to apply: A walk-in-interview of the eligible candidates shall be held at the respective Revenue Circle Office or the district mentioned above on 24th March 20I8 at 10 AM, where they wish to work as T.S.P. The candidates shall also give an undertaking that they have not applied in other Circle Office.